This book sits on my genealogy bookshelves beside several others on the same topic. They have all taught me more about the home of my mother’s mother’s family but this one is especially appealing. When you first flip through the pages you will be pulled in by the photographs, charts, text boxes, sketches and easy to read text. You can browse on any page or read cover to cover. I’ve done both. 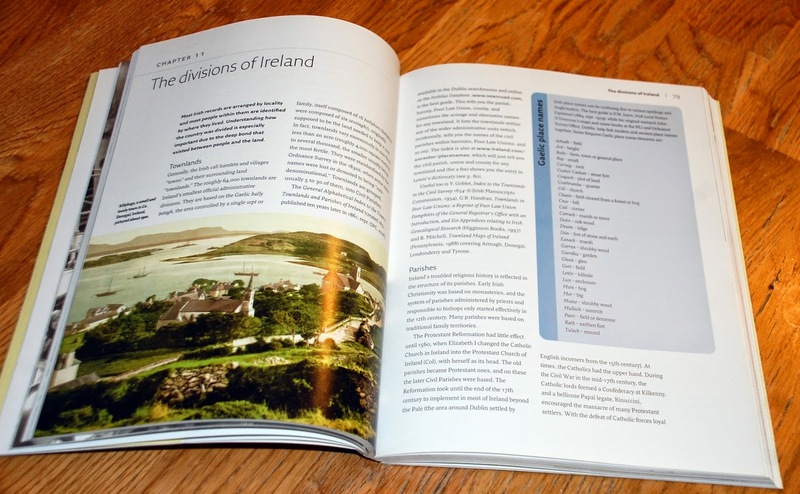 When you get past the appealing layout you’ll find the content full of research tips and Irish facts and history. Within the section on the United States Mr. Adolph gives these suggestions for research: NARA, societies, civil registration, censuses, directories, religious registers, newspapers, biographical dictionaries, wills, naturalizations, shipping lists, army records and land records. Each has a brief description of their value to genealogy. In the same section there are text boxes about: the colonization of America, President Kennedy, criminals sentenced to transportation to the colonies and further reading. He then writes about hiring professional genealogists, materials available through societies, useful magazines and books, websites and biographical dictionaries. He describes repositories in Dublin and Belfast and the county heritage centres. The ‘Divisions of Ireland’ section is especially important to understand in order to locate the records you need. The difference between a townland, a parish and a barony is important. I was confused before reading about the difference. I suggest you find this book in your library or buy a copy. You won’t regret spending an afternoon with this book. 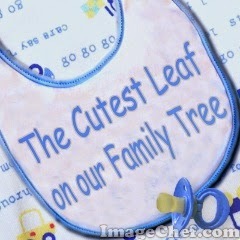 Our family is celebrating the birth of a baby boy for our oldest daughter and our favorite [only] son-in-law. The most adorable baby boy arrived over the weekend, changing the lives of all of us for the better. Phone calls, emails and congratulations flew between family members as the news spread. My husband & I are now grandparents! There are many things I want to share with the newest love of our lives. I want to show him mountains and meadows and sit with him on a sandy beach as he fills a bucket of sand. I want to help him to color and bake cookies and plant a garden. I have a long list of books I want to read to him as he cuddles on my lap. The story I most want to share with this precious boy is the story of our family. I want him to know about my loving mother and my hard working father; how they met at a square dance; worked hard for our family and took us on fun vacations in our camper. I want our grandson to know about my very independent Nana who could whistle and who knew the names of all the birds and flowers. I want to tell him about my Grandma who canned vegetables and took in boarders to help support her seven children during the depression. I want to tell him stories about the carpenters, bakers and soldiers from Ohio, Pennsylvania, Germany and Ireland who made our family what it is today. This little boy with tiny fingers and a cute nose is motivation to write my family stories. When I’m not reading or cuddling or taking him for a walk I will be recording the stories for him. The New Civil War Handbook. If you are researching an ancestor who served in or lived during the time of the Civil War it would be good to brush up on the facts. This 158 page handbook might be just the place to begin. You can learn there are almost two dozen names for the conflict including ‘The Brothers’ War’. You can learn that the average age of Union soldiers at the time of enlistment was 25.8 years and that one in every four Union soldiers was born outside of the United States. I learned that although the Union won the war more Union soldiers (43,012) were mortally wounded than Confederate soldiers (37,000) and more Union soldiers (224,586) died of disease than Confederate soldiers (120,000). I learned that my state, New York, lost more soldiers in the war (46, 534) than any other state. I knew that my 2nd great grand uncle, John Mark, had been killed in action at Chickasaw Bayou, Miss. Dec. 28th 1862. Mark Hughes’ Handbook records 1,929 Union soldiers and 207 Confederate soldiers were killed, wounded, captured or missing as a result of that battle. This gave me a clearer picture of the scope of the battle that claimed John Mark. If you are interested in details of battles, war strategies and biographies of those involved you will want a more detailed book. This one is just an introduction but it will get you started on the right path. The new year is here and it is time for a fresh start. People have made resolutions to learn a new language, clean out their closets and get fit. Genealogists have made their resolutions as well. I have been reading posts about bloggers who are scanning photographs, organizing documents and taking classes to learn new skills. It all sounds ambitious and exciting. 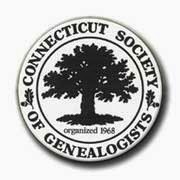 I have been reading other blogs about a Genealogy Do Over. These bloggers are taking a fresh look at documents and other sources that they have already collected. I can see the value of this and it sounds very appealing. Thus far I have resisted the urge to clean off my desk top and join my fellow bloggers. Why? I didn’t want to get side tracked from a goal I set for myself. enter for some time. This is the year to do it. I am entering the “Tell Your Family Story” Essay Contest. This contest focuses on families in New England. My goal was to write about my great-great-grandparents, Patrick and MargaretBrady Coyle who left Co. Cavan, Ireland and settled in New Haven County, Connecticut. I have lots of documents related to them and their children and want to share their story with a larger audience to possibly meet ‘new’ cousins and learn even more. Along with my ten page essay I had to send along copies of my documentation. Ironically, in doing this I had to do many of the same things my fellow genealogists are doing. I had to get out my original documents, look them over with a fresh eye to insure they contain the data I wanted; scan them and organize the scans. Even though I have not joined group to get a fresh start on my research I have the same result. Mrs. Annie Kilday, aged 93, widow of James Kilday and a former well known resident of this city, died Sunday afternoon at the home of her daughter, Mrs. Catherine Thompson of 50 Park Avenue, Wildemere Beach, Milford. She had been in failing health for the past several years. Born in Ireland, Mrs. Kilday was the daughter of the late Patrick and Mary Madden Brady [These names are incorrect.]. She resided in Derby for many years until 34 years ago when she removed to Milford to make her home. Her survivors include two daughters, Mrs. Thompson, with whom she made her home, and Miss Frances Kilday of New Haven; a brother, John Brady of East Orange, N. J., six grandchildren and nine great grandchildren. The funeral will be held Wednesday morning from the Colwell Funeral Home, 116 Elizabeth Street and at St. Gabriel’s Church, Wildmere Beach, Milford for a high Mass of requiem, time to be announced. Internment will be in the family plot in Mt St Peter’s Cemetery. Friends may call at the funeral home tonight from 7 to 10 o’clock and Tuesday from 2 to 5 and 7 to 10 p.m.
"Mrs. Annie Kilday, Former Resident, Died in Milford." The Ansonia Sentinel 28 July 1952: 6. Kansas City, Missouri: The Irish Genealogical Foundation. This small hardcover book begins with maps and a brief history of County Cork including mentions of the Normans, Vikings, ancient bloodlines, tribes and invasions. There are several maps of the county, drawn at different times in the history of the county. The bulk of the book is an alphabetical list of surnames with related spellings and a history of the family name. Some histories fill a column and others a single line. Of course, the families I am interested in have brief histories. For further research the Addendum has a list of works that are “good examples of published sources available to those researching their Cork roots.” They can be found in the Irish Genealogical Foundation library. There is also a list of Irish repositories for Cork research. I had hoped to discover more about the English & Mullane surnames in this book. However, there are some names with more extensive information. The value of this work for your research depends on which surname you are researching. Each year I make Genealogical Resolutions. I haven’t met them all but I have tried. Last year I resolved to go through our house and photograph our family treasures so our children will know the stories behind my great aunt’s World’s Fair spoon, my mother’s cut glass bowl, pieces of Waterford Crystal from Ireland and other treasures. I have made a good start on this project. I posted about many of the items on ‘Treasure Chest Thursdays’ in my blog. This year I will continue to photograph family treasures and to write the stories behind them. I also resolve to learn more about my maternal grandfather’s family. Nathaniel Gardner, 1882 NY – 1944 NY, was the son of Leopold Gartner/Gardner, 1860 Austria – 1948 NY. I have gathered some limited information on this family while they lived in New York State but have no information about their lives before they crossed the Atlantic. Robert J.Friedman at ‘Steps to the Past’. I read about his experience and contacted him and we exchanged emails. All of this led me to sign a contract with Steps to the Past. My resolution to learn more about my Jewish roots has begun. The research will begin in January. Watch my blog where I will share the findings.